A report released today by the World Health Organization (WHO) and Alzheimer’s Disease International (ADI) calls upon governments, policymakers and other stakeholders to make dementia a global public health priority. This new report provides the most authoritative overview of the impact of dementia worldwide. To prepare the report, the World Health Organization and ADI commissioned reports from four working groups of experts and sought additional inputs from nearly two dozen international contributors and more than 20 expert reviewers. 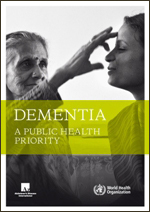 increasing the priority given to dementia in the public health research agenda. To prepare the report, titled “Dementia: A Public Health Priority,” WHO and ADI commissioned reports from four working groups of experts and sought additional inputs from nearly two dozen international contributors and more than 20 expert reviewers. The project leaders were Dr. Shekhar Saxena, Director, Department of Mental Health and Substance Abuse, WHO; Marc Wortmann, Executive Director, ADI; Dr. Daisy Acosta, Chairman, ADI; Prof. Martin Prince, Institute of Psychiatry, King’s College London; and Ennapadam. S Krishnamoorthy, Director and T.S. Srinivasan, Chair, The Institute of Neurological Sciences, India. Publication of the WHO/ADI report comes on the heels of an impassioned plea for action by global public health expert Prof. Peter Piot who, as former UNAIDS Executive Director, helped lead the world in turning HIV/AIDS from a certain death sentence into a manageable illness. In a recent speech, Prof. Piot described dementia - and Alzheimer's disease in particular - as a “ticking time bomb” given the rapid growth in aging populations worldwide. According to ADI research, now given even further legitimacy in the WHO’s report, the number of people living with dementia worldwide, estimated at 35.6 million in 2010, is set to nearly double every 20 years, reaching 65.7 million in 2030 and 115.4 million in 2050. Drawing striking parallels between dementia today and HIV/AIDS in the 1980s, Prof. Piot argued that the world must tackle dementia with a similar level of urgency and concerted resources. “If the world needed a wake-up call, it is on this global crisis. I do not see any alternative than to treat Alzheimer’s with at least the attention we gave HIV/AIDs,” said Piot. “There is an increasing body of evidence that the risk factors that can increase a person’s chances of developing Alzheimer’s disease are the same as those that cause many other non-communicable diseases (NCDs) such as cardiovascular disease, cancer, diabetes, and lung disease,” says Ann Keeling, Chair of The NCD Alliance and Chief Executive of the International Diabetes Federation. “Last year’s UN High-Level Meeting on NCDs in New York formally recognised that mental and neurological disorders, including Alzheimer’s disease, contribute significantly to the NCD burden worldwide. By working together to address these common risk factors, the global health community can make great inroads into the burden of disease caused by Alzheimer’s disease and these other NCDs, that together cause 3 in 5 of all deaths worldwide today."